This Halloween Trail Mix is perfect for a Fall snack or Halloween party! 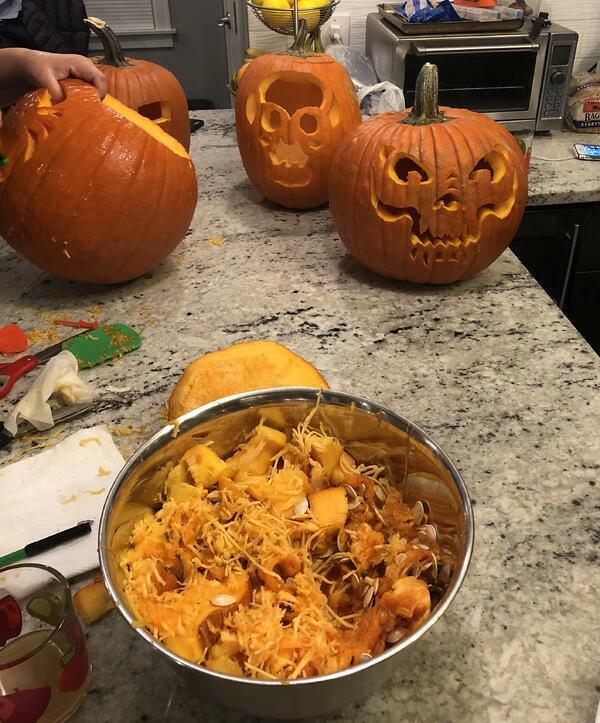 We’ve started a tradition at our house of carving our pumpkins the weekend before Halloween. We have a friendly contest to see who can carve the best pumpkin. This year I made the most delicious Halloween Trail Mix with spiced toasted pumpkin seeds from our pumpkins! It’s a great way to use up Halloween candy, and such a fun snack for both kids and adults! I’ve learned a great little trick to get all the stringy pieces of pumpkin pulp off the seeds. First, clean out the inside of the pumpkin as usual. Put everything – seeds and pulp into a very large bowl or pot. Rinse the seeds and pulp under running water. Pick out the larger pieces of pumpkin pulp. Remove as much of the stringy pumpkin pulp as possible. Now fill the very deep bowl or pot with water. The pieces of pumpkin will sink and the pumpkin seeds will float to the top. Once you’ve gotten all the pumpkin pulp removed drain the seeds in a colander. Do not use a paper towel to dry the seeds! The paper will stick to them. Are toasted pumpkin seeds good for you? Pumpkin seeds may be small, but they’re packed full of valuable nutrients. Eating only a small amount of them can provide you with a substantial quantity of healthy fats, magnesium and zinc. Because of this, pumpkin seeds have been associated with several health benefits. Combine 1 tsp cinnamon, 1/4 tsp salt, and 2 tbl white sugar in a bowl. Stir to combine. Place pumpkin seeds in a large bowl and pour butter mixture over seeds, top with sugar and spice mixture; toss to evenly coat. Spread coated seeds in a single layer onto a baking sheet. Bake in the preheated oven, stirring occasionally, until seeds are lightly browned, about 40 minutes. Remove baking sheet from oven; sprinkle sugar over seeds and stir until evenly coated. 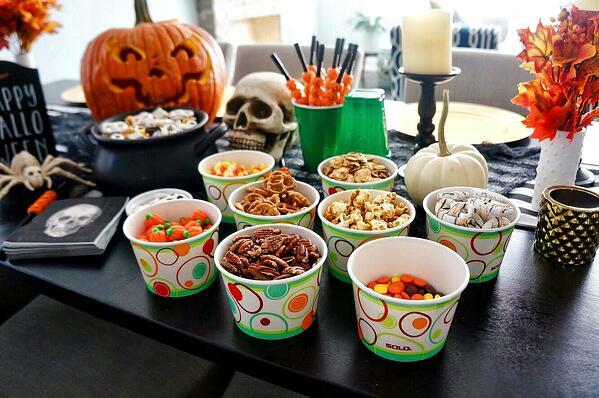 Once the seeds are toasted and cooled, set up your trail mix station with trail mix ingredients in Solo Paper Bowls. I started with a basic trail mix. What goes in trail mix? Nuts – Almonds, pistachios, cashews, peanuts, and walnuts are popular options for trail mixes. Seeds – since this is a Halloween mix, we’re using our pumpkin seeds, but other popular options are sunflower, sesame, flax, or hemp seeds in trail mix for an extra boost of nutrients! Dried Fruit – dried fruit can be a great source of fiber, antioxidants, calcium, and vitamins A, C, and K. Popular additives are Dried apples, cherries, cranberries, goji berries, blueberries, strawberries, apricots, raisins, banana chips, figs, pineapple chunks, mango, and dates. 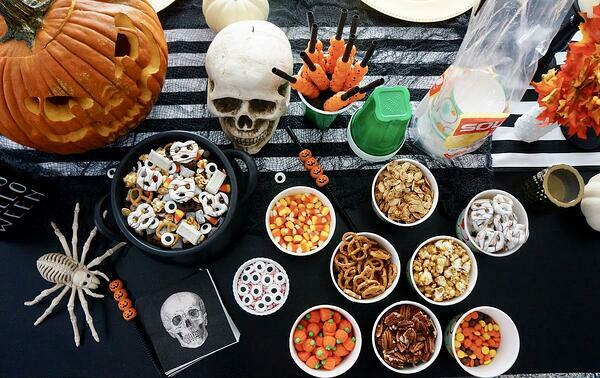 Grains – to add some extra fiber to your Halloween Trail mix, mix in pretzels, whole-grain cereals like Chex, granola, air-popped popcorn can all add a little bit of crunch. Sweets – now here’s where it gets fun! 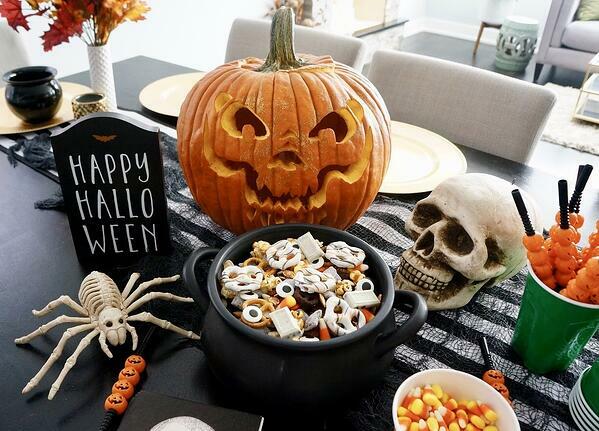 Add your favorite Halloween candies to the mix! I chose candy corn and pumpkins, Reeses pieces, white chocolate chips, and mini oreos. I added some candy eyeballsfor a festive touch! Since we’re going for fall flavors in this Halloween Trail Mix, I chose pecans, raisins, maple granola, pumpkin seeds, nutmeg, and cinnamon as the base. I put my sweet choices in Solo Bowls so my guests could customize their mix. Everyone has their own individual tastes and cravings, so I listed these mix ideas without set ratios or measurements. There are no rules for trail mix—combine whatever sounds good! 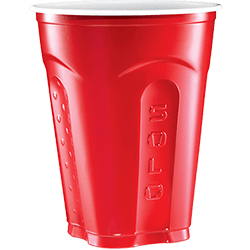 The best part about Solo Cup’s bowl to go is they come with a convenient plastic lid so you can save what you don’t eat for later!